Locks have been around since man first decided to keep his belongings to himself, around 4,000 years according to evidence of the oldest lock, found in the ruins of an ancient Egyptian palace. Other very old examples of this early type of lock have been found in various locations around the world and, although improved over the centuries, the design is recognizable as a pin tumbler or lever lock, the forerunner of the cylinder lock still commonly used today. The first Egyptian lock comprised a wooden bolt securing a door, with a slot with several holes on its upper surface. A device attached to the door contained wooden pins which would drop into the holes and secure the bolt. The key, also wooden, was a large toothbrush–shaped affair, whose 'bristles' were actually pegs that matched the holes and pins in the lock. To open the door, it would be inserted into the keyhole located below the pins and lifted, raising the pins and allowing the bolt to be slid out. Locks and keys are mentioned in the Old Testament and were used by the ancient Greeks, although in a different and less secure form than their Egyptian counterparts. The Romans developed the idea of the Egyptian lock, substituting iron for the wooden lock and often bronze for the key. Keys were no longer too big to lose (or lift), indeed some Roman keys were small enough to wear on a finger. Roman locks, too, were an improvement on the Egyptian model. 'Wards' were developed – projections inside the lock which demanded a corresponding 'bit' on the face of the key. Only the key with the correct slots for the projections to pass through would be able to rotate and throw the bolt. Astonishingly, locks changed little over the following 1,700 years or so. Warded locks were actually quite easy to pick – given a tool that could clear the projections and a bit of patience – but efforts were made more to confuse or confound the lock picker rather than to re–engineer the lock. Keys were made exquisitely complicated, and very ornate. Keyholes were obscured so lock pickers couldn't easily identify them, and dummy keyholes were designed to waste an intruder's time. But in 1778, Robert Barron patented the double–acting tumbler lock. The tumbler (or lever) falls into a slot in the bolt which will yield only if the tumbler is lifted out of the slot to exactly the right height. As its description suggests, the Barron Lock had two such levers, each of which had to be lifted to a different height before the bolt could be withdrawn. Barron's device was developed further in 1818 by Jeremiah Chubb, who incorporated into the lock a spring which would catch and hold any lever that had been raised too high by a lock picker. Not only did this add an extra level of security, it showed when the lock had been tampered with. While Barron and later Chubb were busy with levers, Joseph Bramah was following an entirely different route in lock development. His safety lock, patented in 1784, is a small metal tube with narrow slots cut in one end. When the cylindrical key is pushed into the lock, slides are depressed into the slots. They must all be exactly the right length, as dictated by the slots, or the bolt cannot be thrown. So convinced was he that his lock was inviolable, Bramah put up Â£200 reward (about Â£250,000 in today's money) for anyone who could pick it. It was more than 50 years before the reward was claimed, by an American locksmith. The mid–nineteenth century saw huge activity in lock development, based mostly on Bramah's cylinder lock or Barron and Chubb's lever locks. In 1848 in the US, Linus Yale, and later his son, also Linus, patented and improved the Yale compact cylinder lock, based loosely on the earliest pin–tumbler Egyptian model. Even now, the Yale lock is one of the most commonly used domestic locks. Serrations on the edge of the small, flat key raise pin tumblers exactly to the correct height, allowing the cylinder of the lock to rotate and the bolt to be withdrawn. The key is made in a number of different cross–sections – wards of a kind – which, when combined with various serrations, offer thousands of variations. Locks were not just engineered for the domestic market, nor did they always need a key to open them. By the end of the nineteenth century, and with demand from increasingly frustrated banks and businesses threatened by criminals who had only to reveal firearms to obtain safe keys or combinations from terrified staff, James Sargent introduced a lock that incorporated a clock which would allow a safe to be opened only at a pre–set time. The combination lock had originated back in the seventeenth century, but by the 1870s was proving to be a useful security device for safes and vaults. The bolt mechanism is released only when the correct series of numbers or letters is rotated on a dial on the outside of the lock. Each correct throw of the dial allows a series of slots in rings threaded on a central spindle to line up and release the bolt. 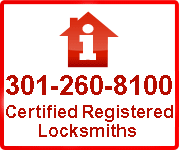 Of course, any locksmith will tell you that if a thief wants something badly enough, has the resources, time and knowledge to get it, a lock won't keep him out. So it proved. Criminals thwarted by clever locks looked for other ways to get into a safe and blew the doors off instead. Safe makers responded to this threat by introducing a second series of bolts into the safe door. Any explosion automatically bolts the door using this locking device. In spite of some extraordinary innovations in lock engineering, it remains the case that most locks in use today are based on the Bramah, lever, Yale and combination models. 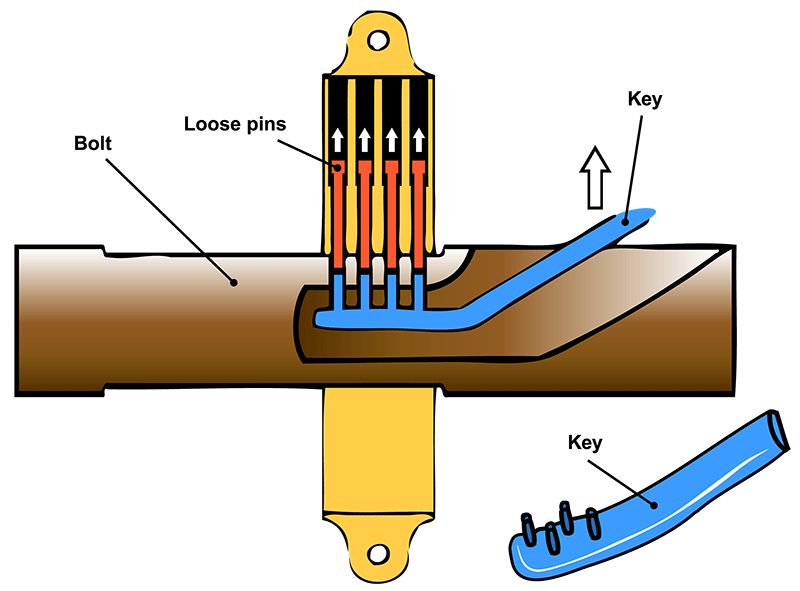 Keys have developed too, and some now open a lock using magnets, not serrations. Master keys are not magic, but careful arrangements of wards, so a master key can be shaped to avoid the wards in all the locks it masters. Alternatively, two keyholes, or two sets of levers, or two concentric cylinders (in Yale locks) are used. Sitemap Quality control This web page is designed for both desktop PC and handheld devices.